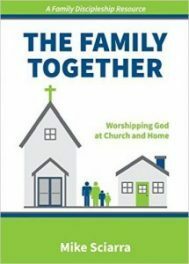 The Family Together is about leading your household to worship God everywhere they go. It's a call to engage your household in the process of following Jesus. It's a call to lead them in daily family worship and to worship with God's family. It's about being together in God's presence to praise the glories of the grace of God in Christ. Sciarra aims to primarily encourage parents, as well as future parents, grandparents, and church leaders. If you're a young parent, be encouraged that you can build good habits in your family, and while it won't be a guarantee that all your kids will love Jesus, it will ensure you are doing what God wants you to do in His strength. If you are a parent already in the midst of the process of bringing children up, be encouraged you that you can change course and do what pleases God in your family even if you feel like you've failed. Some of the ideas you will read might feel like a airplane pilot telling the passengers he is about to fix the plane's engines midair. Changing course is difficult, but the blessings are worth it. The Bible gives a multigenerational household discipleship model that has the Bible and prayer as the basis for a life lived in honest, transparent, dependence on God. This book aims to encourage fellow-servants of Jesus, comforting the discouraged, convincing the unconvinced, and blessing Christ's Church. This book will point people to Christ and Scripture, giving a practical vision for the awesome task of leading others to worship Jesus in all of life. May God be glorified and His people blessed.